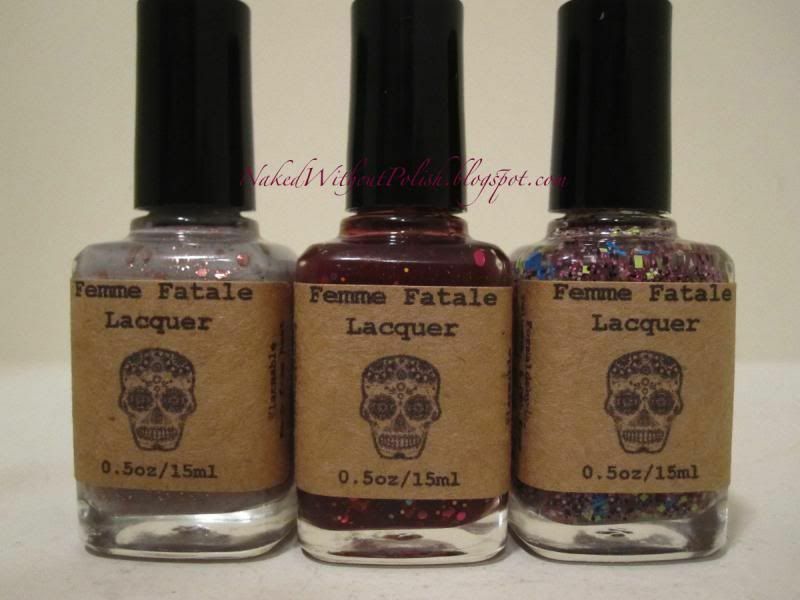 I've been eying Femme Fatale Lacquer for a while, I finally gave in and bought 3 polishes to review for you all! I decided to be well rounded and grabbed a creme, a jelly and a top coat. I went in knowing which creme I wanted. I had seen pictures of MaKayla Rose that made me fall head over heels for it. I have to admit, it took me a bit to decide which other 2 to grab, but I finally decided on Berry Go 'Round and 80's Skull Party. Unfortunately Berries 'N Cream was sold out, so I kept it in the berry family and grabbed Berry Go 'Round. I still really want Berries 'N Cream though! 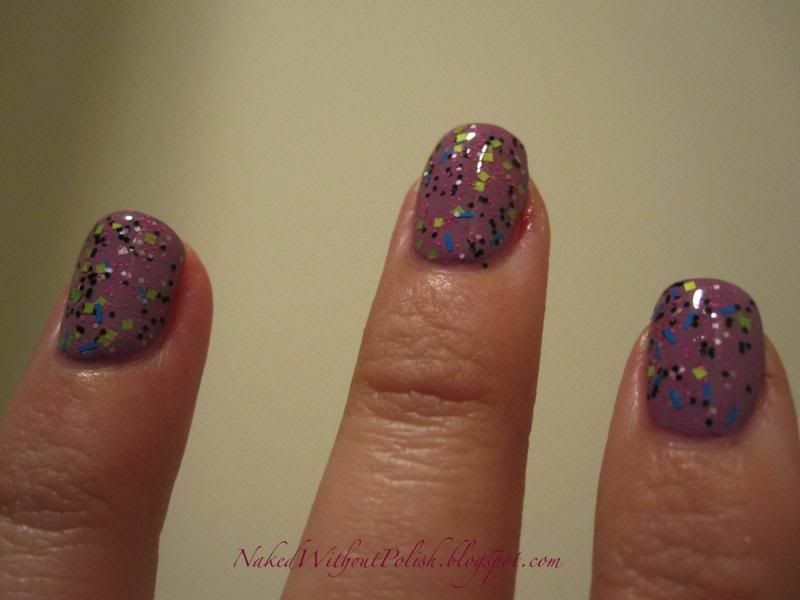 Keep reading to see my swatches and find out what I thought of these polishes!! 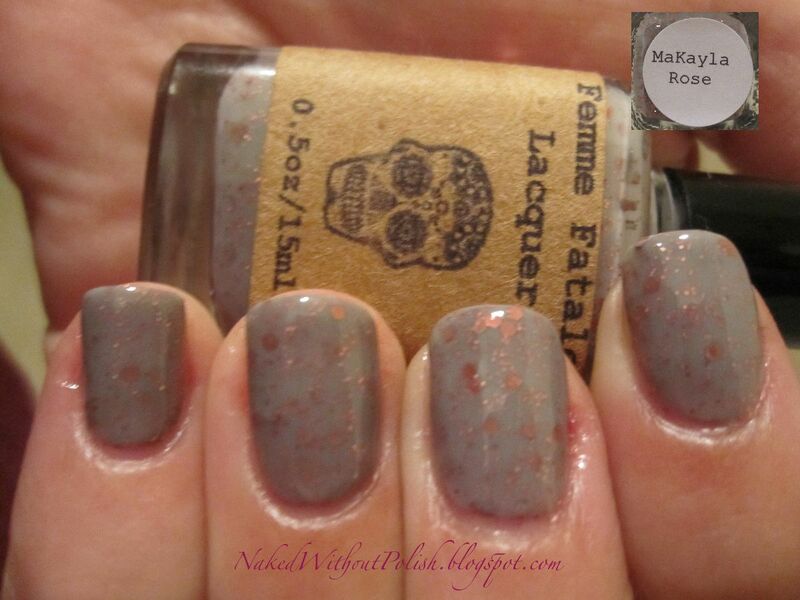 MaKayla Rose is a milky grey base filled with medium sized rose hexes and rose micro glitter. 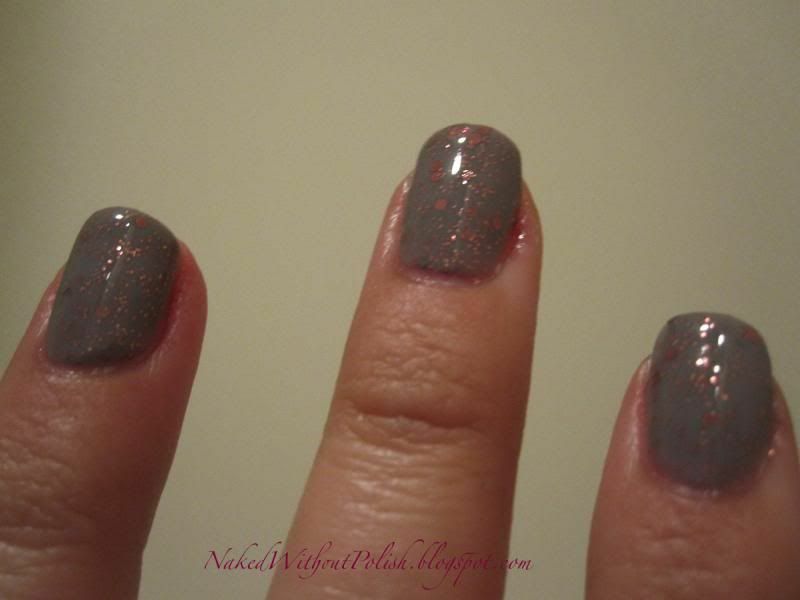 This is two coats of MaKayla Rose with OPI Natural Nail Base Coat and Glisten & Glow HK Girl top coat. MaKayla Rose reminds me of my favorite cashmere sweater! There's something so soft and comfortable about wearing it. 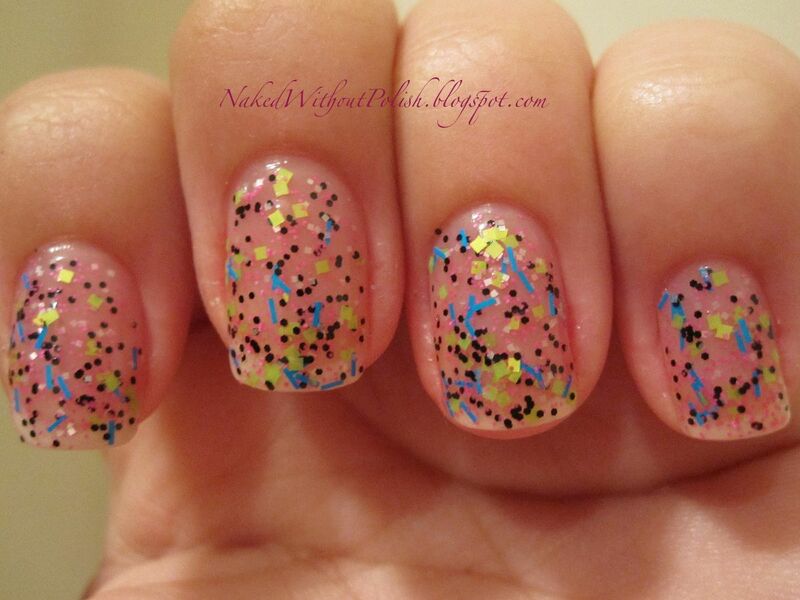 Berry Go 'Round is a berry jelly base filled different sized hex glitter in gold, pink, teal and fuchsia. 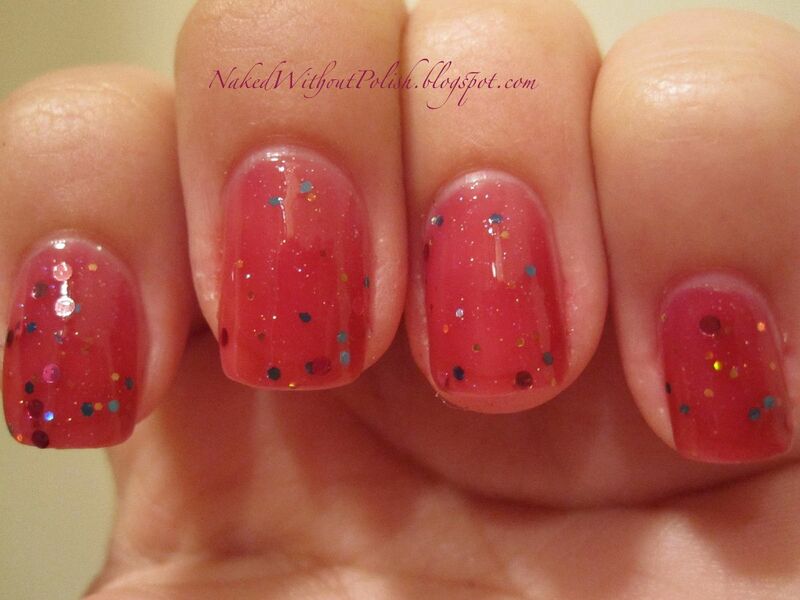 This is two coats of Berry Go 'Round with OPI Natural Nail Base Coat and Glisten & Glow HK Girl top coat. 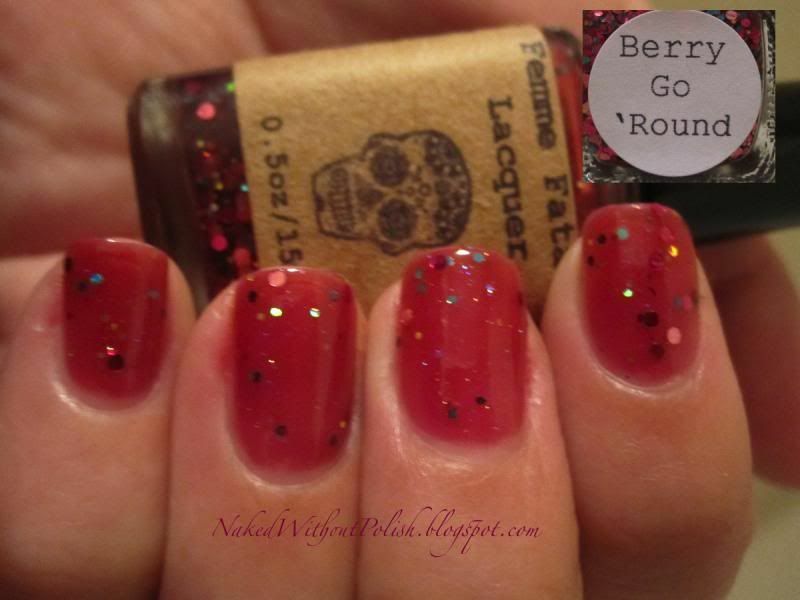 Berry Go 'Round has such a beautiful formula. So easy to apply and work with. 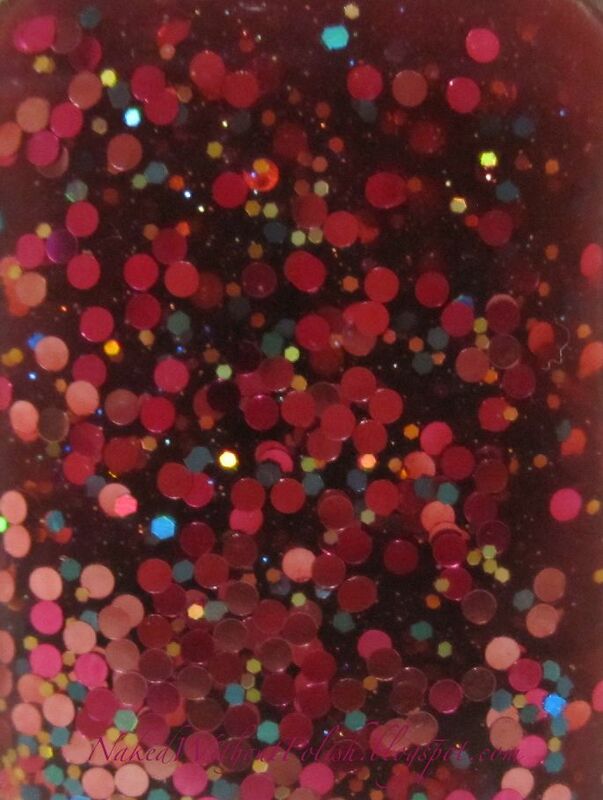 The only disappointing thing was that I had issues getting the larger glitter out of the bottle. 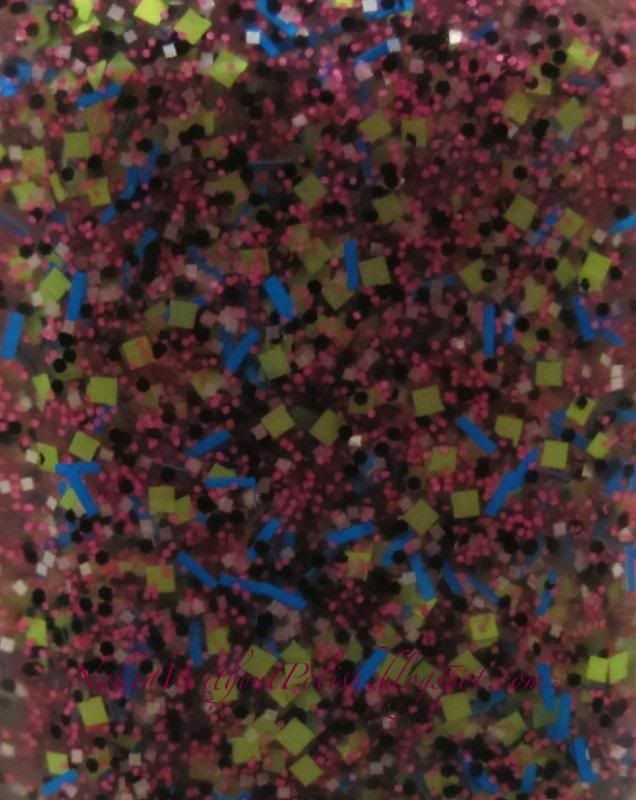 They look dispersed in the bottle but it seems the majority of them are sunken and they didn't want to grab the brush. 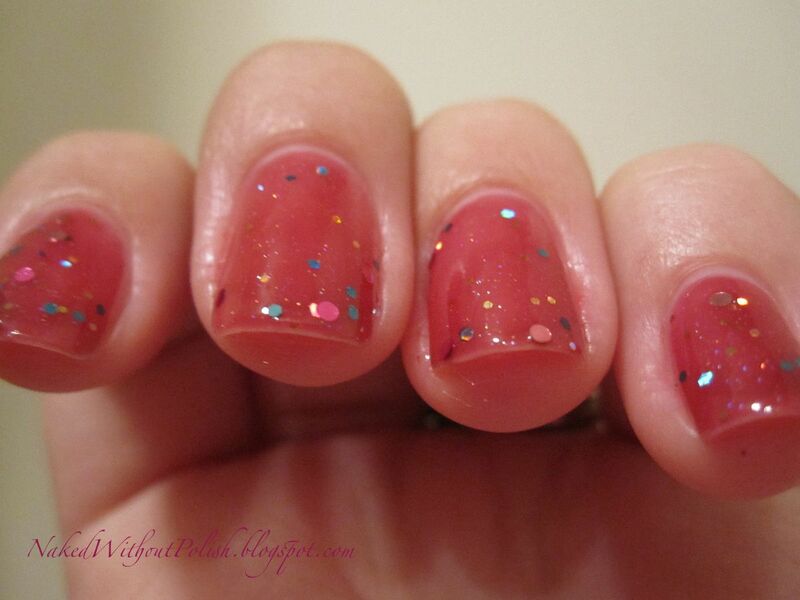 Even though I couldn't get as many of the larger hex glitters on my nail as I wanted, I still loved Berry Go 'Round. 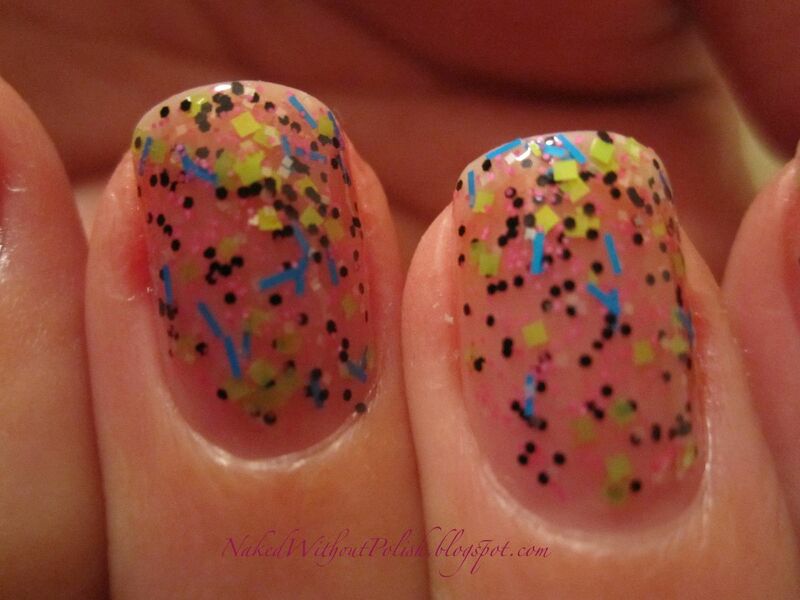 The gently dispersed glitter really let the beautiful jelly base shine. It's not over powered with a lot of glitter. 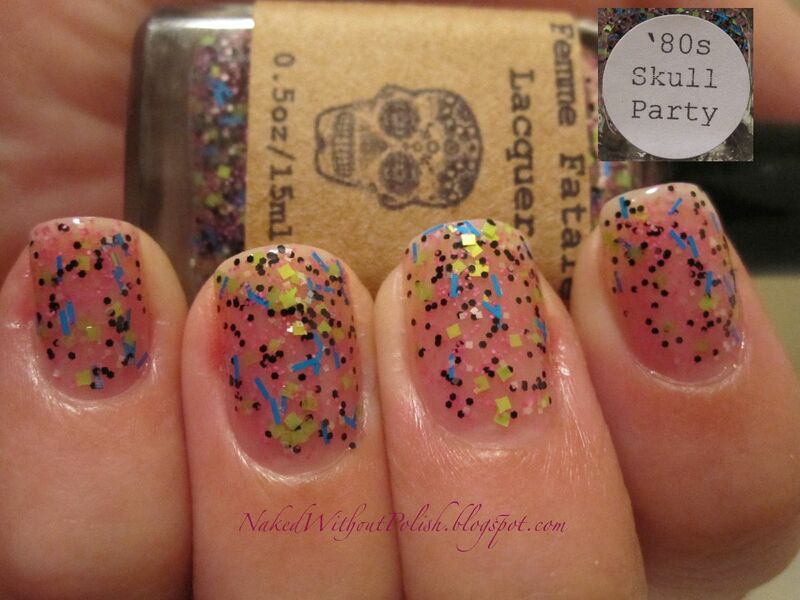 80's Skull Party is a clear base filled with neon green, blue, pink, white and black multi shaped glitter. 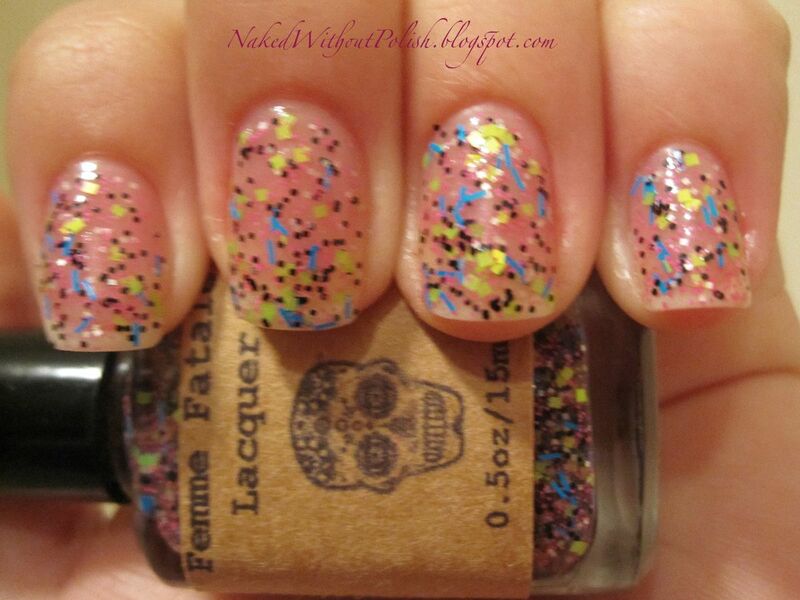 This is three coats of 80's Skull Party with OPI Natural Nail Base Coat and Glisten & Glow HK Girl top coat. I was so glad this was the top coat I picked! 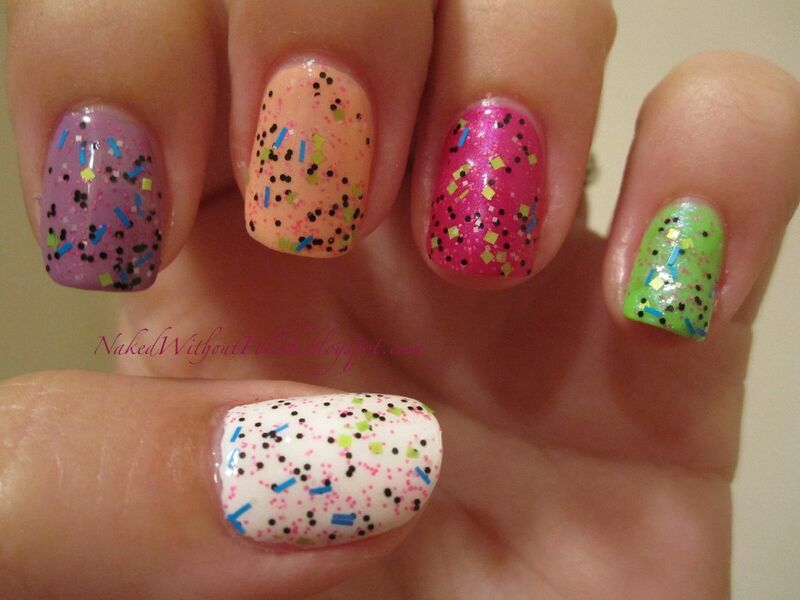 I loved this combination of glitters! 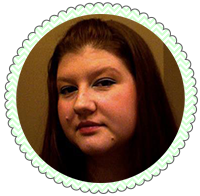 It was easy to apply, I didn't have to hunt for glitters in the bottle and there was no blotting or placing glitter. 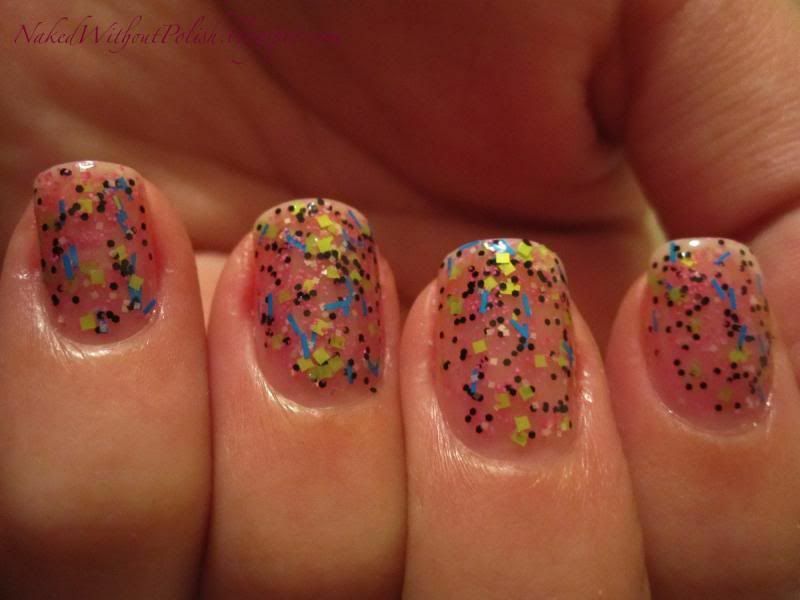 The glitter combination seems like it'd be such an obvious combination, but I don't have anything like this in my collection. It's so much fun!! Now to toss it over some undies to see how they can help it transform! Left to right: LynBDesigns - If I Lose Myself, Rimmel London - 60 Seconds - Pulsating, Essence - Colour & Go - Modern Romance, Cult Nails - Love at First Sight and Cult Nails - Tempest. This is one coat of 80's Skull Party over two coats of LynBDesigns - If I Lose Myself. If I Lose Myself is a beautiful neon green jelly with a bright blue shimmer throughout. These two really complimented each other. It was as if they were one polish! Loved this combination! This is one coat of 80's Skull Party over two coats of Rimmel London - 60 Seconds - Pulsating. 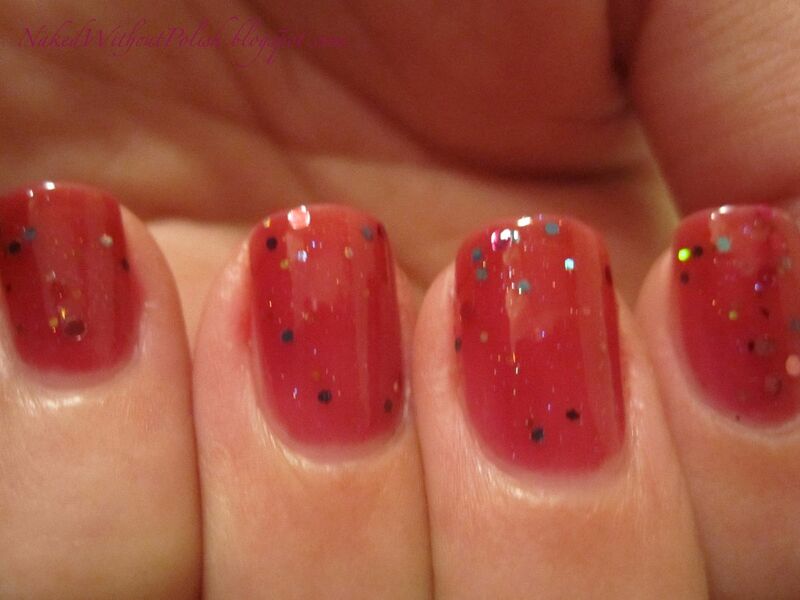 Pulsating is a bright fuchsia shimmer. I really wanted this combination to work, but Pulsating took the lead and overpowered 80's Skull Party. 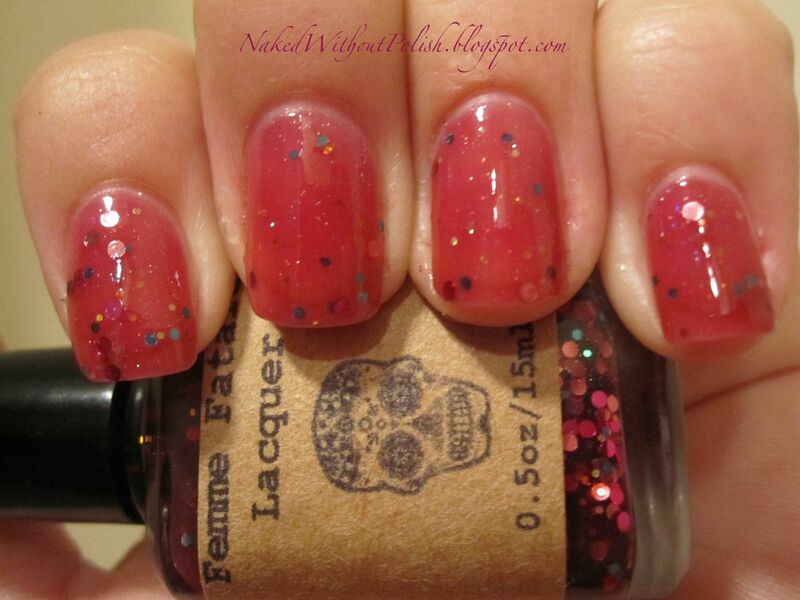 This is one coat of 80's Skull Party over two coats of Essence - Colour & Go - Modern Romance. 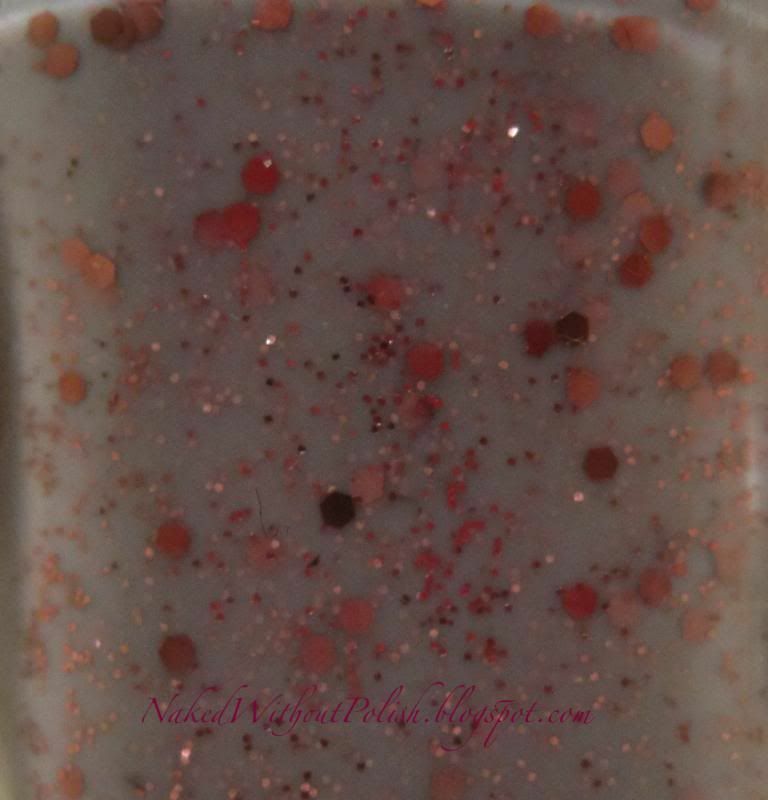 Modern Romance is a soft peach with a hidden pink shimmer. I wanted to like this combination, but Modern Romance was too bland of a color and didn't do anything for 80's Skull Party. 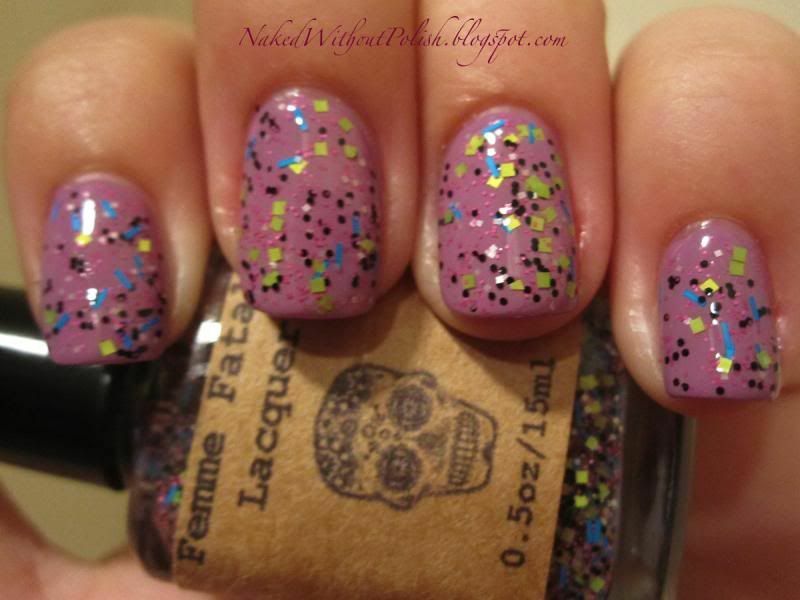 This is one coat of 80's Skull Party over two coats of Cult Nails Love at First Sight. 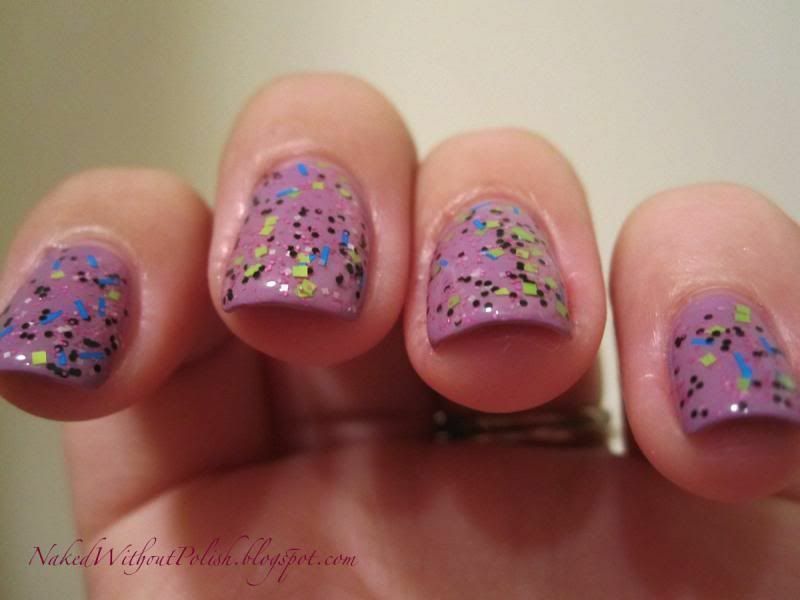 Love at First Sight is a bright purple creme polish. This pairing was my absolute favorite!! Love at First Sight added exactly the right amount of pop to 80's Skull Party. Match made in heaven!! 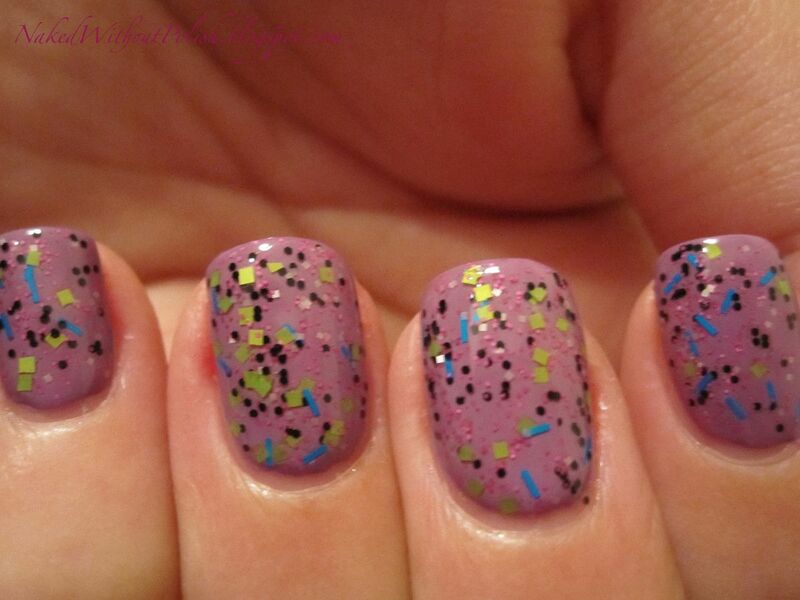 This is one coat of 80's Skull Party over two coats of Cult Nails - Tempest. Tempest is a lovely white creme. This would be great if the white glitter didn't blend into the back ground. I just really wanted to try to get something the others would really pop off of. However, the green glitter didn't even pop like I wanted. This pairing was a dud. Now to show you my favorite pairing!! I just had to do a mani with it! This is one coat of 80's Skull Party over two coats of with OPI Natural Nail Base Coat and Glisten & Glow HK Girl top coat. Yup, in love with this pairing!! Did not want to take this off! What do you think? Was this your favorite of the 5 too? 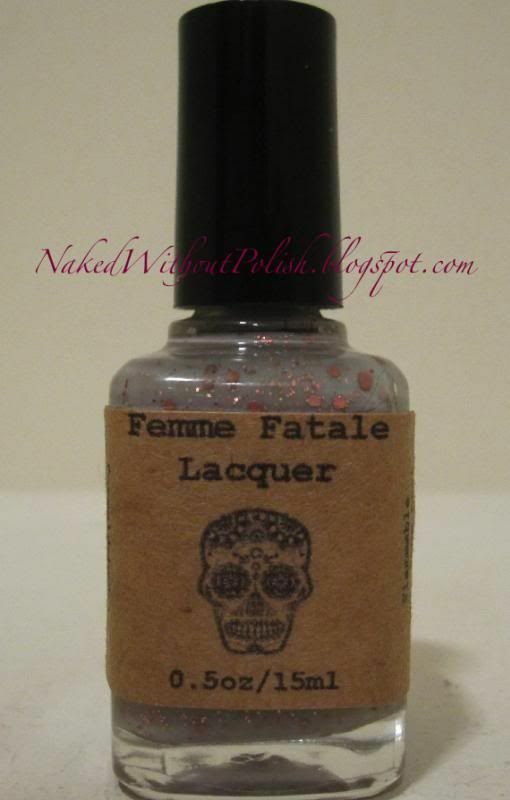 I'm officially a fan of Femme Fatale Lacquer! These three were lovely and definitely made me want more! Can't wait to snag some! You can grab these (or others) for your self over at their Big Cartel shop for only $8 a bottle!! Very reasonably priced!! I have some good news for you all too!! I was given a discount code for my readers!! 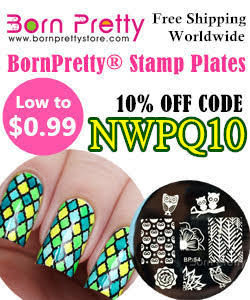 Use the code NWP10 to get 10% off any order!! 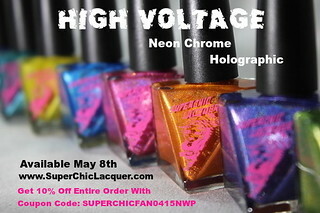 It's good for my readers and their friends so feel free to share the code!! 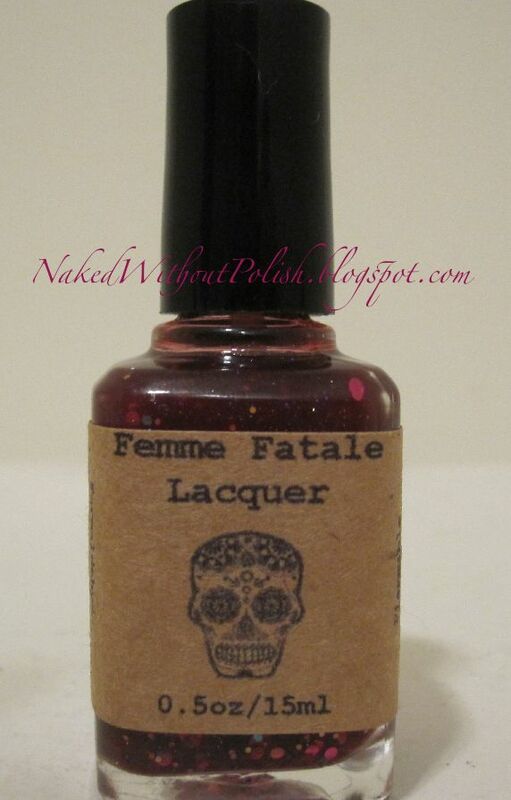 If you snag some of Femme Fatale Lacquer's beauties, share your swatches on my wall or tag me on Instagram! !